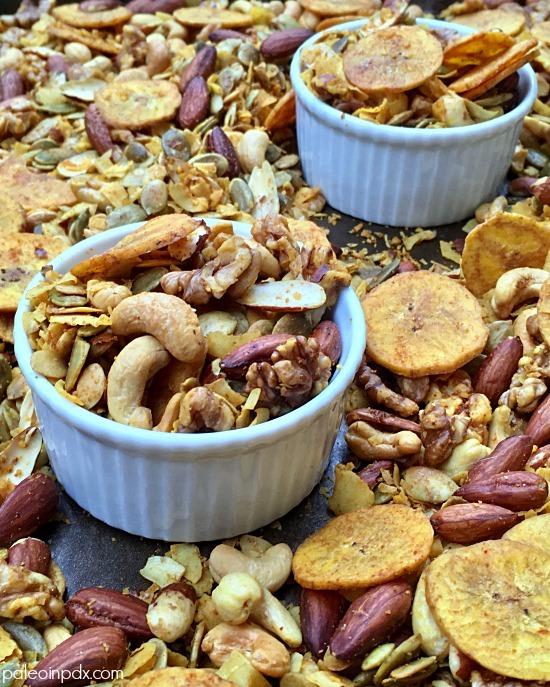 It’s here: the grain-free party mix of your dreams! It’s oven-baked, crunchy, salty and insanely delicious. It is a must-have snack for get-togethers during the holiday season. I grew up eating homemade Chex Mix every year during the holidays from the time I was a little kid on. It was something I ate copious amounts of (along with homemade Christmas cookies) and thoroughly enjoyed. I also adored its salty aroma when it was baking in the oven and it lured me into the kitchen every time. I especially loved the pieces that were extra coated in seasoning and stuck together in a chewy sorta way. After discovering I was allergic to gluten several years ago and then later going totally grain-free, I thought my Chex Mix days were over. And, honestly, for a long time, I didn’t miss or think about this snack mix much, but something struck me this year and I wanted to create my own version. I also assumed there were others that wanted a grain-free party mix as well, so I went for it. I’m so glad I did because it does not disappoint! 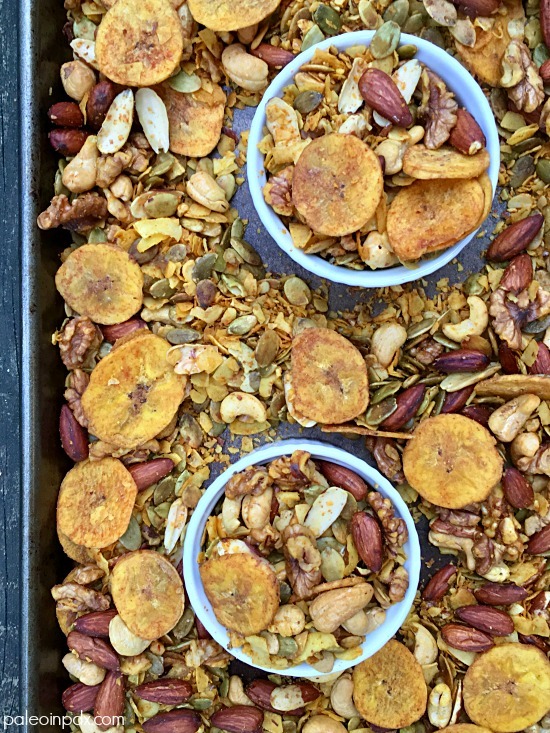 In a large roasting pan, mix together the almonds, cashews, walnuts, pumpkin seeds, coconut flakes, and plantain chips. In a small bowl, whisk the melted butter or ghee (obviously you don’t have to melt avocado oil, if using) with the coconut aminos, fish sauce, and all the seasonings. Pour the seasoning mixture over the nut mix and stir to coat. Bake in preheated oven for 60 minutes, stirring every 15 minutes. Once cooled, store in airtight container.